I am an alumnus of Manila Science High School. To be admitted to this school, students take an entrance examination and must have a grade of at least 85% in Mathematics, Science, and English subjects, and a grade of at least 83% in all other subjects. Once enrolled, there is a star section in each year. Forty students with the highest grade point average for each class are assigned to these star sections. I was in the star sections of Bohr and Einstein during my last two years of high school. 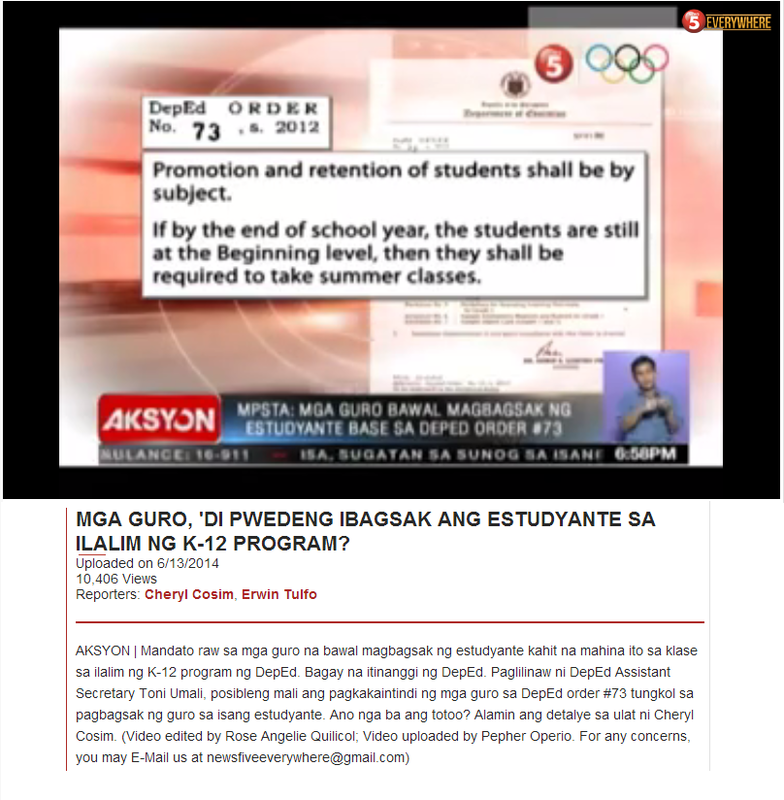 My high school education is an example of both school streaming and class tracking. Entrance is limited to students with above average academic performance thus students with similar academic performance are grouped in one school (school streaming). And within each class, the top students are placed within one classroom (class tracking). These two ways of grouping similar students can indeed benefit instruction in basic education since it allows for lessons to be customized. However, there is the question of inequity especially when teachers are not randomnly assigned and resources are not equitably distributed among schools or classrooms. Since academic performance correlates with family income, homogeneity can happen in terms of socio-economic status in which rich children study in one school while those who are poor study in a different school. Extreme homogenity is therefore expected to lead to higher achievement gaps. Grouping similar students together within schools (streaming) or classrooms (tracking) based on past literacy skills (reported by parents), family socioeconomic status (SES) or reading attitudes might affect their reading achievement. Our multilevel analysis of the reading tests of 208,057 fourth-grade students across 40 countries, and their parents’, teachers’, principals’, and their survey responses yielded the following results. Streaming was linked to higher reading achievement (consistent with customized instruction), but tracking was linked to lower reading achievement (consistent with more help opportunities). Students had higher reading achievement when classmates had stronger past literacy skills (suggesting sharing ideas) or extremely poor ones (help opportunities). Also, when classmates have higher family SES, students had higher reading achievement (suggesting sharing resources), with diminishing marginal returns. When classmates’ family SES differed more (more diversity), students with greater past literacy skills had higher reading achievement (Matthew effect). Lastly, when classmates had better reading attitudes, students with lower past literacy skills showed higher reading achievement (modeling, norms). When classmates’ reading attitudes differed more, students had higher reading achievement (contrasting cases), although extreme differences weakened this link (less homophily). These results suggest that streaming across schools and mixing of students within classrooms (by past achievement, family SES and reading attitudes) are linked to overall reading achievement. At least, for reading achievement, it appears that streaming across schools is beneficial, but students need to be mixed within classrooms. 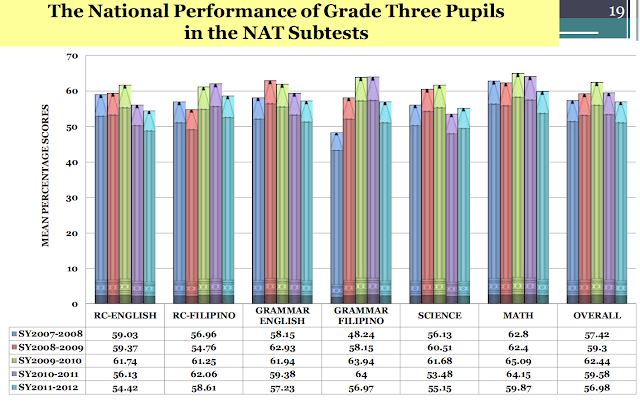 Thus, based on this study, the idea of having Manila Science High School as a selective school is good, but the practice of having star sections in each class is not. In addition, the authors conclude, "These results also suggest avoiding extremes, where severe school streaming reduces help opportunities and sharp differences among classmates prevent customized instruction by higher achieving students." 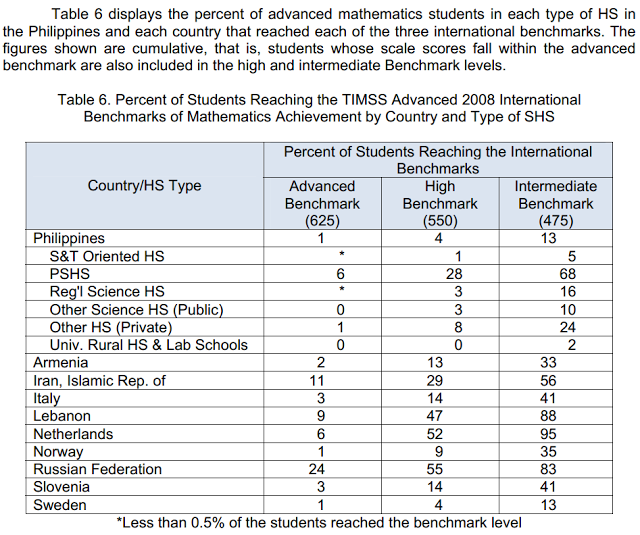 Aside from students from the Philippine Science High School (PSHS), students in other special science classes in the Philippines, unlike students from other countries, are not even reaching intermediate benchmark scores in mathematics. Grade 10, Introductory College Physics, Analytic Geometry and Introductory Calculus as well as Advanced Chemistry and Research. 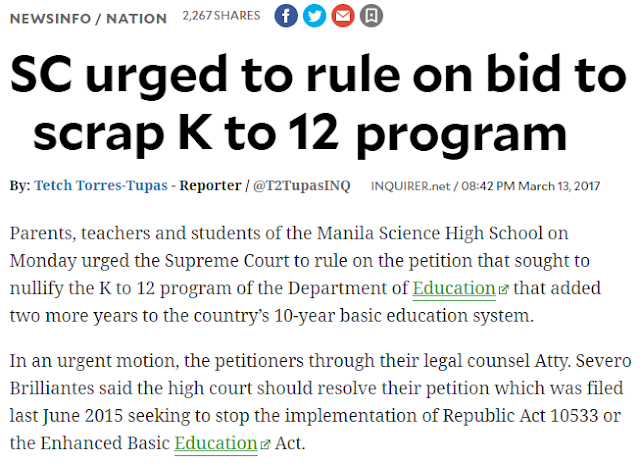 The harm that DepEd's K to 12 has done to basic education sadly goes much farther than this. With the introduction of tracks, students are now being segregated within schools. It will just be a matter of time before the effects of demoralization and assimilation materialize. The Philippine basic education system will easily become a school system of self fulfilling prophecies and heightened inequity.